Virender Sehwag, Indian Cricketer who scored more than 200 runs in ODI after Sachin Tendulkar. Fans call him Viru, Prince of Najafgarh, etc... He is a right-arm off-spin bowler as well. He leads Delhi Daredevils team on IPL matches. 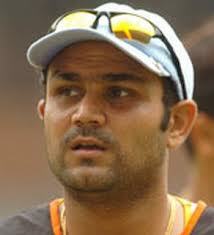 Sehwag born on 20th october 1978 in New Delhi, India. His father name is Krishan, a grain merchant. His mother name is Krishna Sehwag. Sehwag two sisters are, Manju and Anju and one younger brother named Vinod. When sehwag was seven years old, his father give a toy cricket bat as a gift from that they inspired to play cricket . He did his schooling in Arora Vidya School in Delhi. In school days, he was very much interested in playing cricket. In 1990, his father notice sehwag was interested in cricket game and he warned him not to play cricket and broke a teeth in his childhood. Sehwag’s mother give permission to play cricket. Sehwag completed his graduation in “Jamia Milia Islamia”. After graduation, he worked as Assistant Administrative Officer In Oil and Natural Gas Corporation. Later he married and his wife name is Aarti and the couple got a male child named Aryavir. He also do some charity work for the UNICEF. In the year 1997,sehwag get a chance to play for Delhi Team and in the following season he played well. The selector of the Indian cricket team notice their good performance and selected him for the national team in the year 2001. In 2004-2005, he played for Delhi team and captained North zone to Victory. He got “1st Man of the Match award” for good batting against Australia held in Bangalore. In ODI series he scored 103.44 runs per 100 balls. In 2006, he scored his 1st Century against Pakistan team. In ODI series, he is the Highest Individual scorer in the history.He is the fatest 250 in Test Series in 207 balls. In Test series he is the only Indian Batsman to score Two Triple Centuries and he is the one among four Batsman in the History of test Series to score Two Triple Centuries. In 2002 sehwag got Arjuna Award . In 2008,2009 he got Wisden Leading Cricketer in the World. In 2010 he got ICC TEST PLAYER OF THE YEAR and also PADMA SHREE in the same year.